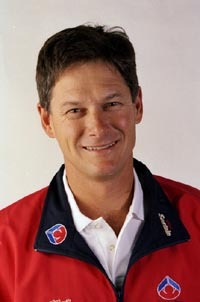 Russell Borgeaud's vast experience in Australian Volleyball led to his appointment as head coach of Australian Under 19 Boy's Volleyball team for the 2003 World Championships in Thailand. Borgeaud has been a coach at the Australian Institute of Sport (AIS) since May, 2002 when at the time he was assistant coach of the Australia men's senior side and the AIS team. Prior to his recruitment to the AIS the 43-year-old had been the Volleyball head coach at the Queensland Academy of Sport from 1994-2002. During that time he coached Australian Beach Volleyball gold medal winners Natalie Cook and Kerri Potharst at the 2001 Goodwill Games. Borgeaud had also assisted with the coaching of Australia's national junior men's team from 1995-1999. Priorto taking up coaching Borgeaud was a well-established international player playing 150 matches for Australia from 1980-1991 and captaining the team in 1982 and 1991. In 1990 he received the Australian Men's Player of the Year award.